Everyone is different. It’s one of the first things that you learn with your breast cancer diagnosis. From the type, stage and grade to the treatments you receive and to the choices you make. Whether or not to proceed with breast reconstruction may be one of those choices. It is so intensely personal and it is so clear that there is no right or wrong. I researched – searched online, read books, talked to women who had reconstruction and to those who chosen not to proceed. I met with a plastic surgeon and talked to doctors. I considered developing a matrix to assist other women with their decision and that may be my next post. In the meantime I’ll share with you the defining factor for myself which I was happy to discover: my teddy. 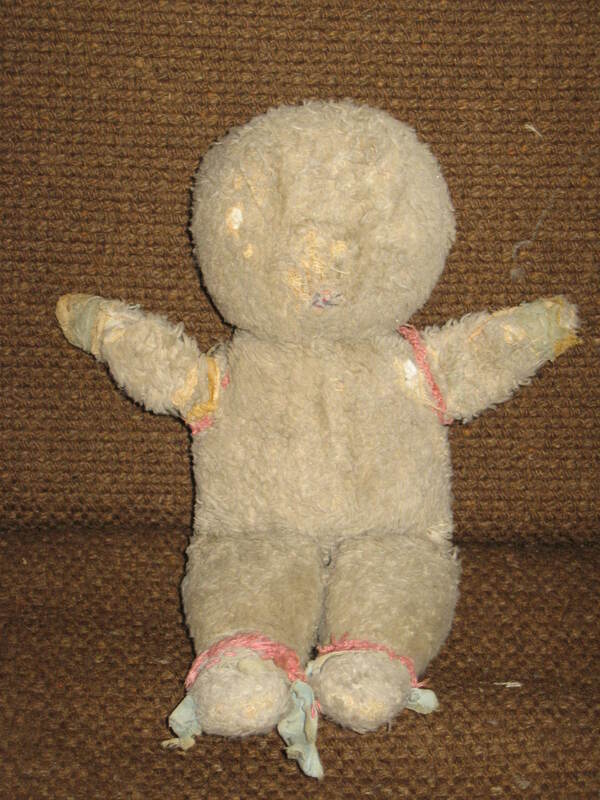 I received my teddy from my grandmother when i was a baby. I carried him every where. Teddy is now 55 years old. The remnants of pink and light blue that are visible around his arms and feet was from the material lovingly sewn or crocheted by my grandmother to give Teddy extended life and protection from my onslaught of affection as a young child. He went everywhere with me. I should have placed something beside him in this photo for context. Teddy is 10 inches tall. He used to have ears and a face. Part of me can conjure an image of how he used to be. But it is a fleeting glimpse. When my grandmother attempted to sew new button eyes on to him, i balked. 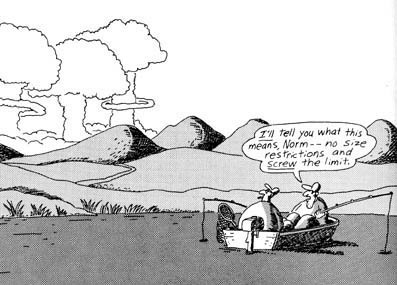 They were never quite right. They changed him. Once these features were lost, they could never be replaced to my satisfaction. It was disturbing to me. I preferred the vivid memory in my head. I had my answer on reconstruction. I searched, and once again, there were no ready answers. I got the feeling, when I elected to pass on reconstruction, at least for now, that I was in the minority. What was I, nuts? Here I was at one of the top cancer centres in the world, with great doctors and I was passing up this great opportunity? Was I the only one? Would it have made a difference to my decison if I’d had the numbers? Probably no, but I may not have anguished so much about it. Accessing provincial medical data bases for the information did not appear to be a speedy option. So I asked a group of women that I have been involved with for many years – the Canadian Federation of University Women www.cfuw.org with close to 10,000 women members across Canada. While there was no available data to confirm the ages of these women, one could surmise from various meetings that these are women who are in the “prime” breast cancer age range. 23% of respondents said they have been diagnosed with cancer (any), 10% or almost half of those, with breast cancer (over the last 30 years). • Over one third had a mastectomy (47/120, 39%) . • One third of the women who had a mastectomy also had a lumpectomy (15/47, 32%). • Over two thirds of the women who had a mastectomy said they were offered breast reconstruction, though not necessarily at the same time (34/47 72%). Some women had to ask for it. Interesting that one third of the women had a lumpectomy AND a mastectomy. I’m one of those. If I were told that over one third of women with breast cancer ended up with a mastectomy, would it have altered my decisions? Probably not. I wasn’t ready to lop it off. And remember, every woman is different. Those stats may not apply to you. They are just a guideline/information sharing. The whole process including the lumpectomy served to prepare me well for the second surgery a few months later. And I was grateful for a medical system that put priority on breast conservation. Approximately 23,000 women per year in Canada are expected to be diagnosed with Breast Cancer (source Canadian Cancer Society statistics 2010). You are not alone. “How are you my Uniboob Mom?” is how my 12 year old son greeted me when I arrived home from the hospital after my mastectomy. It made me laugh out loud. And my new persona Uniboobmom was born. There’s a lot of information out there on breast cancer: the types of cancer, the procedures and treatments, risk factors and suspected causes, blogs about women’s journeys, and of course lots of fundraising sites – but there’s very little out there on what you are in for…where you fit in the whole big breast cancer scheme of things. Maybe you don’t care and that’s fine. But I’m a numbers person and I like context. The first thing you learn is that every woman’s situation is different and that the doctors don’t have all the answers. Pretty quickly I determined that as Grade 1, Stage 1 DCIS I was pretty lucky. This is hardly a death sentence. 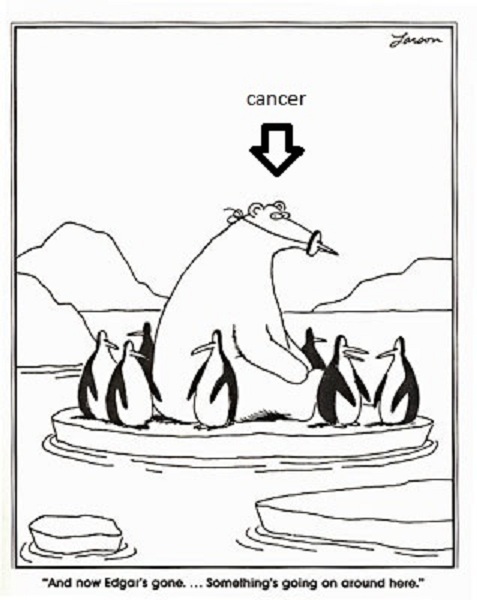 Even so, I really welcomed all the good-news stories people shared – like the ones about your friend’s aunt who had a lumpectomy 30 years ago and is fine today. Each anecdote was unconsciously tallied and filed by my brain for future reassurance. I discovered that the best and most authentic thing someone could say to me was “I’m sorry you have to go through this”. I asked “Just how many women are going through this”? Thankfully I had seen lots of “survivors” at the Weekend to End and knew they were out there. It helped too that my oldest best friend was diagnosed two years before me and had made it through. I learned that the biggest risk factor for breast cancer, and many cancers, is age – even though Breast Cancer is showing up in younger women. Approximately 23,000 women per year in Canada are expected to be diagnosed with Breast Cancer (source Canadian Cancer Society statistics 2010). 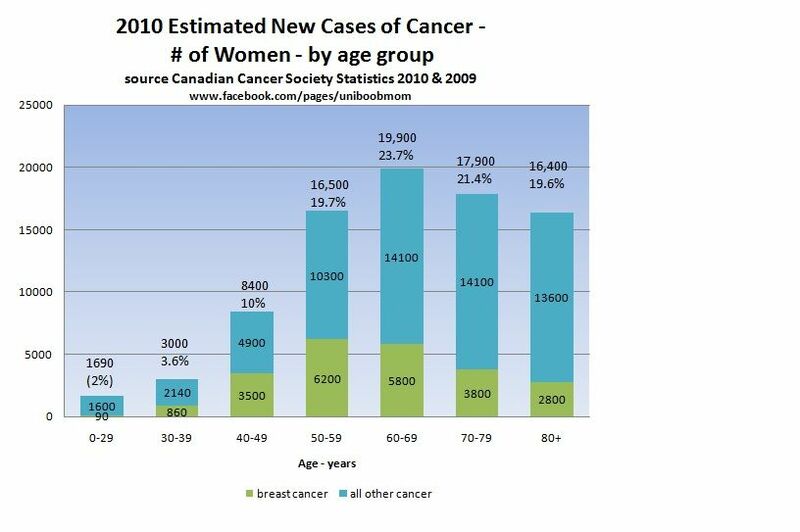 And with the 5 year survival rate at 87% (see http://www.cbcf.org) my guesstimate is that there are easily a quarter of a million Canadian women out there with breast cancer. You proabably know a few.